There was a challenge for us to recover the Wings Platinum 5 Sentinel SuperPro dongle and appropriate so called ‘enable codes’, which enable several software options like VIOSO support, AV prompter and Multidisplay. As the result we have made a sentinel dongle emulator (as well as enable codes) which works on any number of computers using Windows 32bit and 64bit. 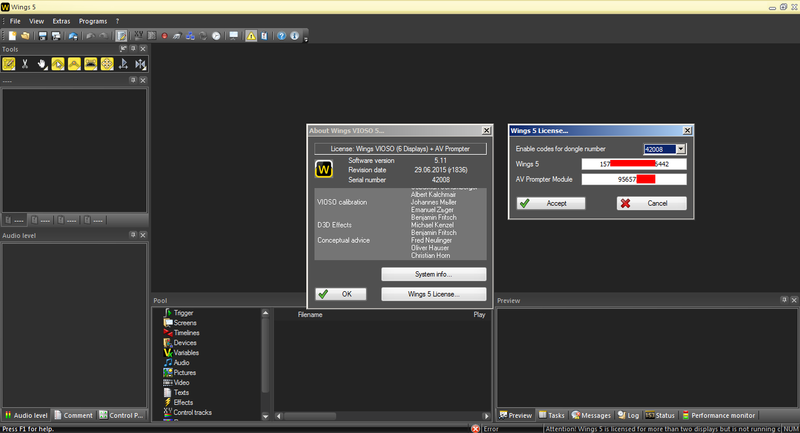 Wings Platinum is the right tool for creating ambitious slide-shows in only a few steps. Many professional speakers use this software for their shows. AV Stumpfl is a family-run business and acts out of conviction with a long-term strategy. Founded by Reinhold Stumpfl the company has been inspired by the idea and the enthusiasm for the big projected picture. As an engineer Reinhold Stumpfl has, as one of the first, developed and manufactured show control technology for slide shows 40 years ago. The company and its team has grown since then and is now integrating the 40 years of experience into modern technology. But still our engineers are aware of their AV roots and very enthusiastic about the power of the big pictures. A software which helps creating a HDAV show obviously has to have the ability to process all common types of media in a straightforward and logical way. Furthermore the aim of Wings Platinum is always to reach the highest possible image quality in playback. You will find a wide range of functionality which supports your live-show and helps making it into a success. For example there are pause markers which allow the speaker a maximum of freedom in connecting sophisticatedly programmed sequences with live-commented passages on demand. This solution (sentinel dongle emulator for Wings Platinum 5) allows you to keep your original hardware key safe. Emulator works on any number of computers without restrictions. Trial version is not available, but you can test emulator’s work remotely. If you want to get more information about this solution please contact us. Dongle emulator software is the right solution to keep you hardware key safe.